Nestled at the mouth of Tampa Bay, southwest of Ft. De Soto Park, Egmont Key State Park can only be reached by ferry, and the vessel transports passengers back in time. 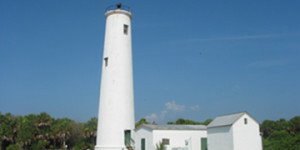 Home to one of the last government-operated lighthouses, which was built in 1858, Egmont Key is a wildlife refuge teeming with dolphins, pelicans and other creatures. Covering 440 acres, the key was once a camp for captured Seminole Indians in the Third Seminole War and also served as a Union Navy base during the Civil War. To reach Egmont Key, visitors board a ferry from Fort De Soto Park for a half-hour journey. At the pristine key, guests can explore the island along old walkways. Palm trees, beach grasses and clear waters adorn the key, and sometimes gopher tortoises can be seen. In the late 1890s, as the United States braced for the Spanish-American War, Fort Dade was constructed on Egmont Key. Today, visitors can explore the crumbling remains of the fort and gaze at a picturesque beach view. Several snorkeling excursions to Egmont Key are offered, and fishing, hiking and swimming are among the activities in which visitors can partake. For more information, visit www.floridastateparks.org/egmontkey/. Estelia Mesimer and her team at Keller Williams Realty in St. Petersburg can help you learn more about the natural treasures in the St. Petersburg area, and assist you with finding your dream home. Their office is located across from the Museum of Fine Arts, and they have a myriad of listings of high-end homes that are in the St. Petersburg area and a short distance from the cultural attractions.